Organizations use fleet monitoring systems for e.g., vehicle tracking, driver behavior analysis, and efficient fleet management. Current systems are designed for commercial use and are of high cost. We present a prototype of a low-cost fleet monitoring system that could be used for non-commercial applications. The system is composed of a device, a service application, and a Web application. The device reads data such as speed and fuel from the internal network of the connected vehicle and the location of the vehicle and sends them to a remote service. The remote service processes and stores the data. The users use a Web application to view the data about their vehicles in real-time. 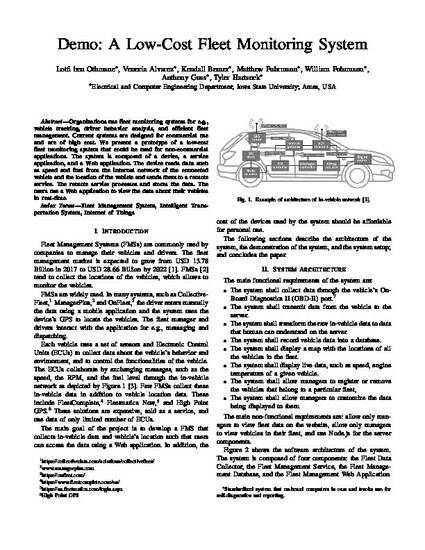 This is a manuscript of a proceeding published as Ben Othmane, Lotfi, Venecia Alvarez, Kendall Berner, Matthew Fuhrmann, William Fuhrmann, Anthony Guss, and Tyler Hartsock, "Demo: A Low-Cost Fleet Monitoring System." In IEEE International Smart Cities Conference (ISC2 2018), (2018). DOI: 10.1109/ISC2.2018.8656826. Posted with permission.